The best Company for Art and Sculpture in Kolkata must be reached out if you want to get the most innovatively designed art pieces for your dwelling and your working place. The company either presents its readymade range or notes down the specifications mentioned by the customers and makes it accordingly. Although an artist may specialize in making these stone and metal carvings, the art of sculpture making does not keep its limit to any particular set of shape, form or size. The dimension of the place where it is to be placed matters a lot in the manufacturing process. 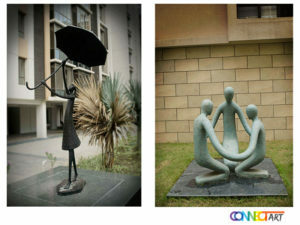 A customized sculpture gives several benefits. The buyer gets the opportunity to choose the type of material, get the exactly fitted sculpture for a particular dimensional room and can choose the other materials according to the budget. The skilled professionals then Makes the sketch of the sculpture exactly according to the specifications mentioned by the customer. Then comes the factor that whether it is an addition sculpture or a reduced one. The differentiation is made according to the technique of making it. In the additional ones, the materials are added to create the carvings whereas, in the reduction type of sculptures, materials are cut or reduced to give it the required shape and form. First, the outline is sketched including all the intricate details. Then the base is created to make the statuette stronger. Mainly strong materials are picked for this purpose like wood, stone or any hard metals. Next, the armature is built which gives the actual support to the figure. It prevents the sculpture from breaking down. The armature can be made either for the whole sculpture or only for the thinner areas like legs or arms in case of human figures. Generally, thick gauge, PVC pipes, plumbing pipes, sticks or any such material is preferred for this step. The basic form is then filled with the chosen material. The filling is done from the larger parts to the smaller parts gradually. Now the details are worked on to give it the realistic look. Textures are added for giving the exact effect when touched. Finally, the sculpture is coated with the colour to bring out the vibrance of the statuette. Sketch is made according to the mentioned points. The basic form is shaped out or carved. Using a pointing machine, some parts are cut or reduced to give it the required form. The details are carved after achieving the desired shape. Finally, it is smoothened and painted. Sculpture is the most demanding Landscape Art Solution besides the paintings. Different forms of art gives an escape from the real world.